Our largest and most powerful heavy duty shredder, the 7-SHRED-1 is ideally suited for difficult size reduction jobs. It has been specifically designed for the toughest industrial applications that demand both power and repeatable results. This large shredder machine has the flexibility of customization for your exacting needs like specialized cutters and working without any additional spray or wash water. Its robust 2-shafted shredding system delivers slow speed and high torque to precondition, shred, or delump a wide range of industries including hazardous waste processing, recycling, agriculture and meat or seafood processing. Not all industrial shredding jobs are the same – talk to us about customizing your heavy duty shredder for your toughest industrial waste reduction needs. 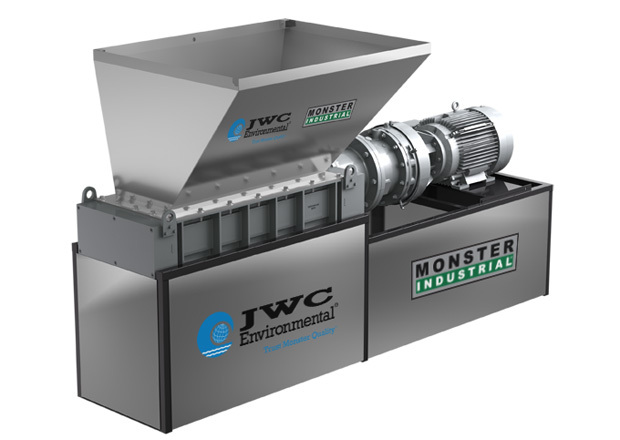 Check out our Monster Industrial solutions on product destruction applications here. 7-SHRED-1 - Our most powerful twin-shafted shredder ever- can generate peak cutting force of 25,000-lbs (11,000 kg) of force.